Site visitors can take the pledge to save paper. As they check off the items they pledge to do, the site automatically displays the effect that their pledge will have. The site also keeps a running total of the combined savings for all the pledges to date. 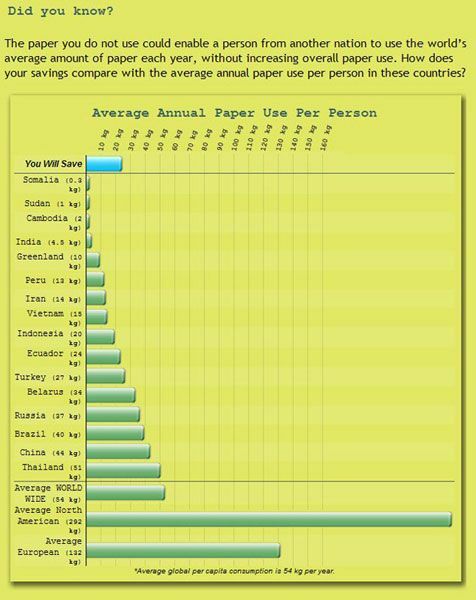 An interactive chart shows the site visitor exactly how much paper they will save, and compares it to the average annual use of paper per person in other nations. 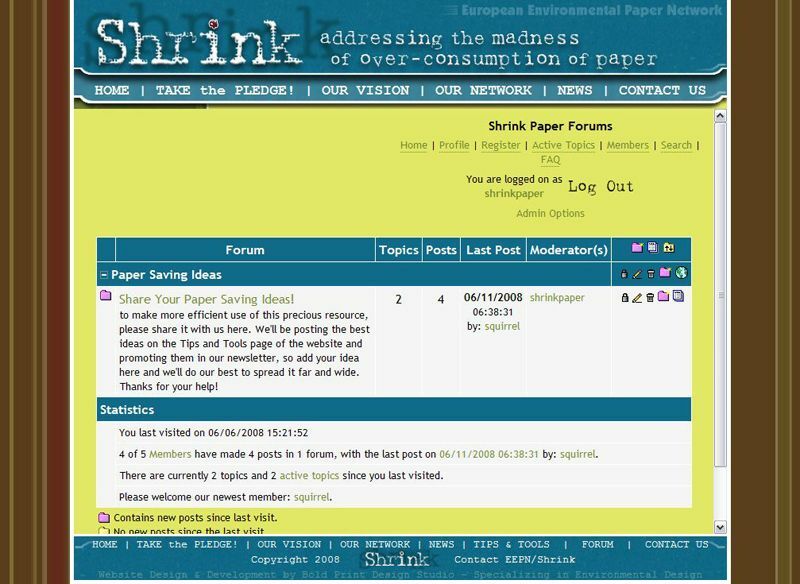 A forum allows site visitors to share their paper saving ideas. 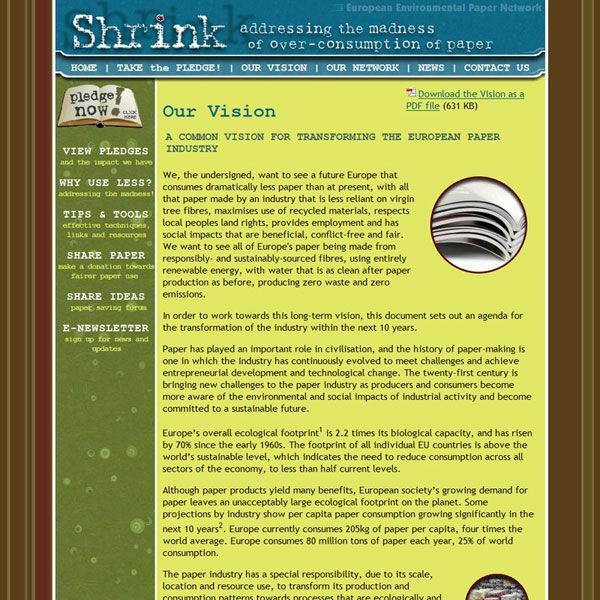 The European Environmental Paper Network approached Bold Print with their new Shrink Paper Pledge campaign and their ideas of how they wanted to utilize a website as the focal point of the campaign. 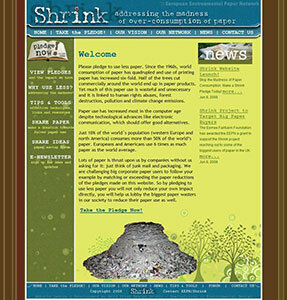 The websites main purpose is to collect pledges and educate people on the issues of paper over-consumption. The pledge consists of a series of actions you’ll take to use less paper that you select by check box. Once you submit, the script on the site immediately displays the impacts your actions will have on the environment. You can then view all the names and locations of those pledged, and the total impact of all those pledged. The whole pledge process and saving calculations are custom web applications built specifically for this site. They also wanted the ability to edit the site themselves as they have sections on their site that will be changing frequently. It was important that we set up the site in our content management system so that their employees can easily add news articles and upcoming events or business happenings. 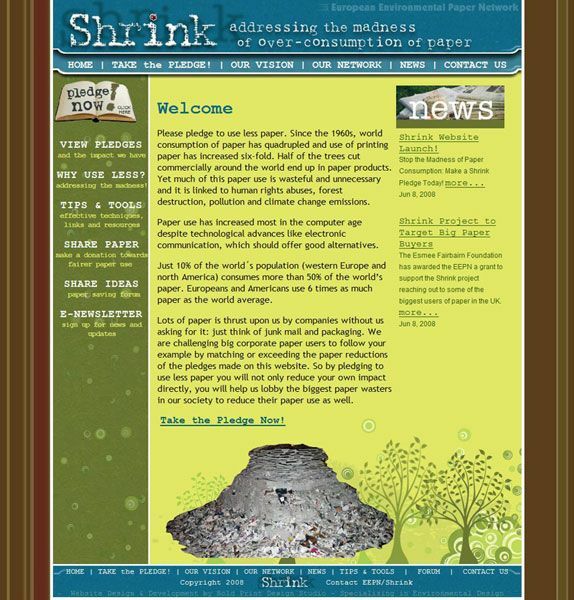 The site also features a forum where people can get together and discuss paper saving ideas and other issues concerning the over-consumption of paper. Once the site was complete, they immediately started working on translations because this is a world wide campaign. We then had to devise a way to allow readers to switch languages, but maintain all of the functionality, and have all of the pledge results from the different pages feed into the same database. You’ll notice the language scroll box on the home page that takes you to the different translated sites. This is still ongoing as they send us more and more translated pages, so some languages might be incomplete.